PS: Friendly reminder the Keele treasure item will disappeared when the event end. Make sure you sell them before it poofed. It's located on the 2nd tab where the materials, gems, coins etc located. 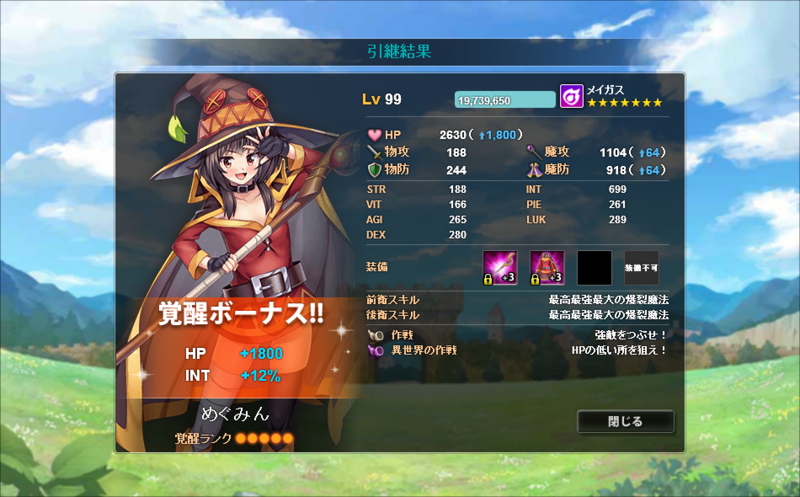 I managed to get 6x Darkness, 3x Aqua and 1x Megumin. I lack a single Aqua to get 10 extra Fairy Sweet Sake. As for Wiz, Yunyun and Eris, I got so many I lost count lol. Thanks for the reminder. I had already forgotten about those treasures lol. Hehehehe. The potential for the most magnificent explosion has been unlocked! Question: Can I get this girl from 5* BFE? I remember getting EX girls from envelopes so I'm wondering if she's applicable as well. Last edited by ofi123; 06-27-2018 at 10:17 AM. @ofi123 No. She was limited time and is currently unavailable. EX employees cannot appear from Black Envelopes. Hmm I could have swore I’ve gotten a 4* EX from one of the BFE I’ve gotten in this event. Guess I would need to screencap next time. Also you said limited time, does that mean she’s not in the pool of girls like past collab girls? @ofi123 Yes. She was only available for the two (?) weeks during her release. She's more likely to return than a collab though. All swimsuits obtained, all eventgirls exept Aqua maxed awakening. Various new 5s also obtained from the "black" posts and black envelopes. And a huge amount of feathers from the excess Megumins and Darknesses drawn. Could not be more satisfied with the results. Since the month is almost over, dont forget the battlecoin shop. Burned through 40 stones and 2 perm sakes in hopes for 6th copy of Aqua for 5* BFE, no luck. Well, overall a very good event for me.